This salad is totally giving me life right now! While I love the warm comforting foods of winter, after a few weeks of all those heavy roasted and stewed foods I start craving fresh vegetables HARD. So today I picked up a $0.99 bunch of kale and looked to my pantry to see what else I could throw into my salad bowl. I toasted up a leftover pita, tossed in a handful of walnuts, golden raisins, and parmesan, then pulled it all together with my favorite tangy champagne vinaigrette. 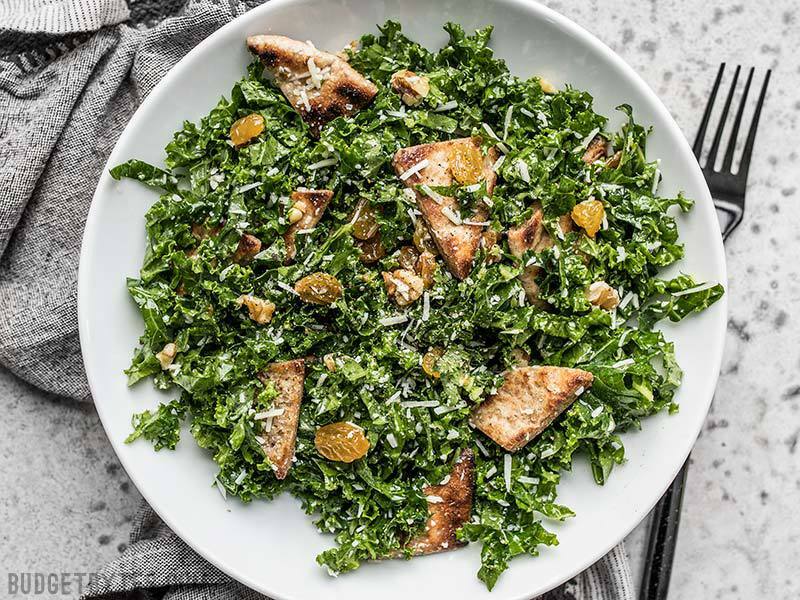 This Kale Salad with Toasted Pita and Parmesan is light but filling, full of earthy-nutty flavor, and has just a few pops of sweetness to make things interesting. It’s simple winter salad perfection. I wanted to make my own champagne vinaigrette for this, but alas, the grocery store didn’t have a single bottle of champagne vinegar. But, the vinegar itself would have cost as much as the pre-made dressing, so I just bought a bottle of my favorite, Girard’s Champagne Vinaigrette (that’s the one in the weird triangle bottle). A non-creamy Caesar dressing would also go nicely with this salad, my favorite being Ken’s Steakhouse brand. Any type of lemon vinaigrette, or even something with a fruity flavor like orange or pomegranate would also be nice! 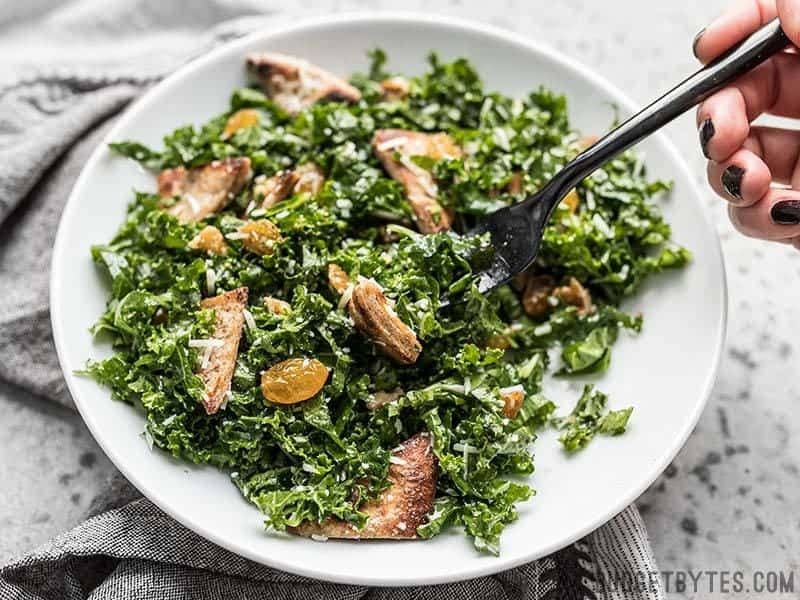 Texture is everything with this salad, so don’t skimp on getting that kale shredded very fine. If you can’t manage to shred the kale, at least be sure to chop it very fine. If you’re buying pre-chopped kale rather than a bunch of kale, chop or shred it even further than how it comes in the bag. Fresh salads are not just for summer! This Kale Salad with Toasted Pita and Parmesan features winter flavors, but is still light, fresh, and crunchy! Pull the kale leaves from the stems. 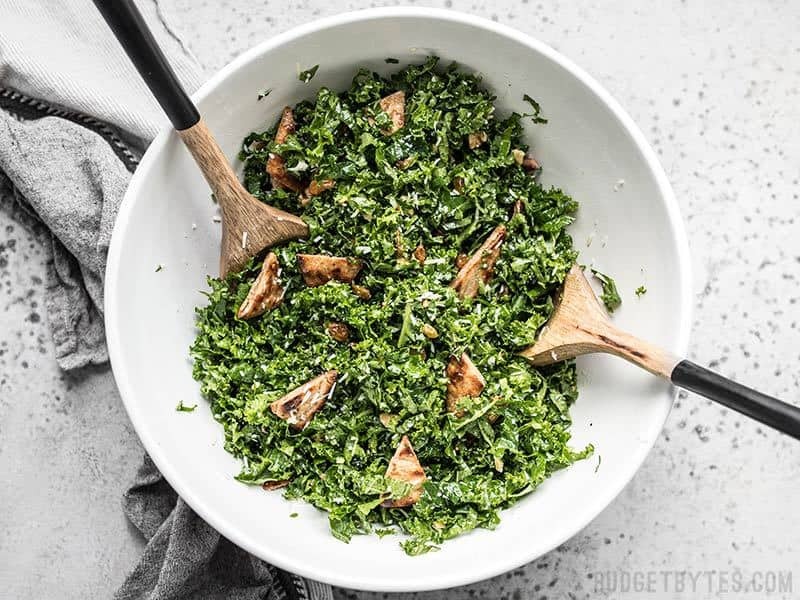 Take a handful at a time in one fist, then carefully pull back your fingers one inch at a time as you slice the bunched kale into fine shreds. Place the shredded kale in a colander and rinse well. Allow the kale to dry as you prepare the remaining ingredients. Cut the pita into 1-inch triangles. 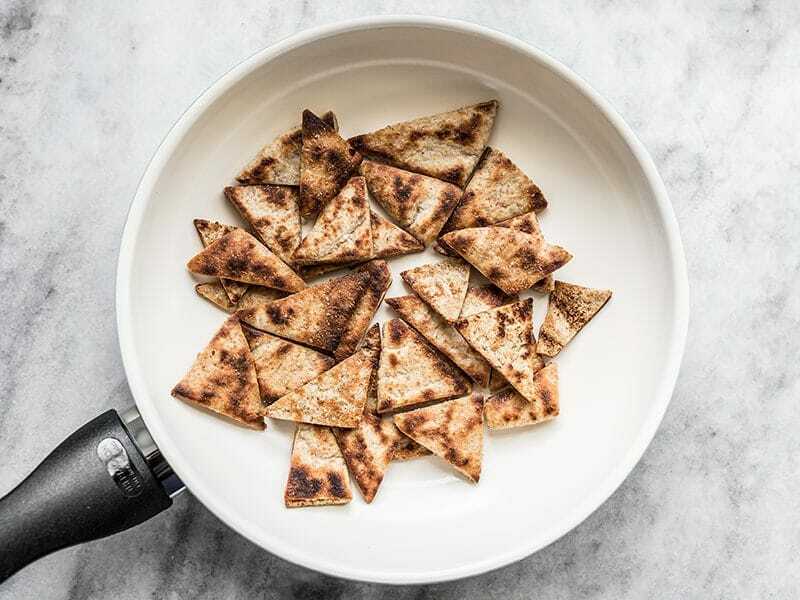 Place the pita triangles in a small bowl and drizzle with olive oil. Toss the pita until it is well coated in oil. Heat a small skillet over medium, then once the skillet is hot, add the pita. Cook and stir the pita until they are toasted and crunchy. Remove the pita from the skillet, then add the chopped walnuts. Stir and cook the walnuts in the dry skillet for 1-2 minutes, or just until they begin to smell toasty. Remove them from the skillet immediately to prevent burning. 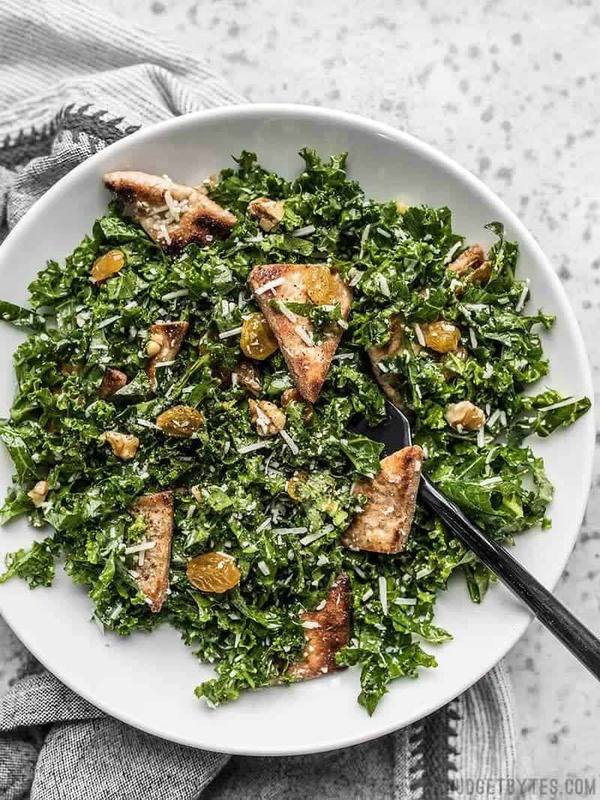 To assemble the salad, place the washed and dried kale in a large bowl. Add the toasted pita, walnuts, Parmesan, and golden raisins. Pour the champagne vinaigrette over top, then toss until everything is coated in dressing and Parmesan. Serve the salad immediately, or let it rest for 10-15 minutes to allow the dressing to slightly soften the kale. Am I the only one who gets cravings for kale? Pull the kale leaves from the woody stems, then shred it finely. 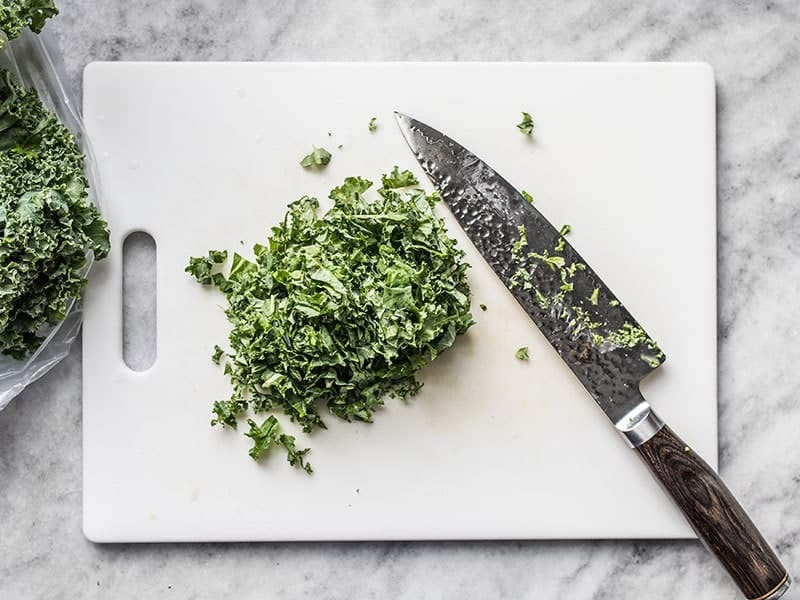 To shred the kale, I grab one handful at a time, compress it in one hand, then pull my fingers back a little at a time as I make fine shreds with the knife in the other hand. If you can’t manage to finely shred the kale, you can just chop it very finely. My one bunch of kale yielded about 8 cups, loosely packed, once shredded. 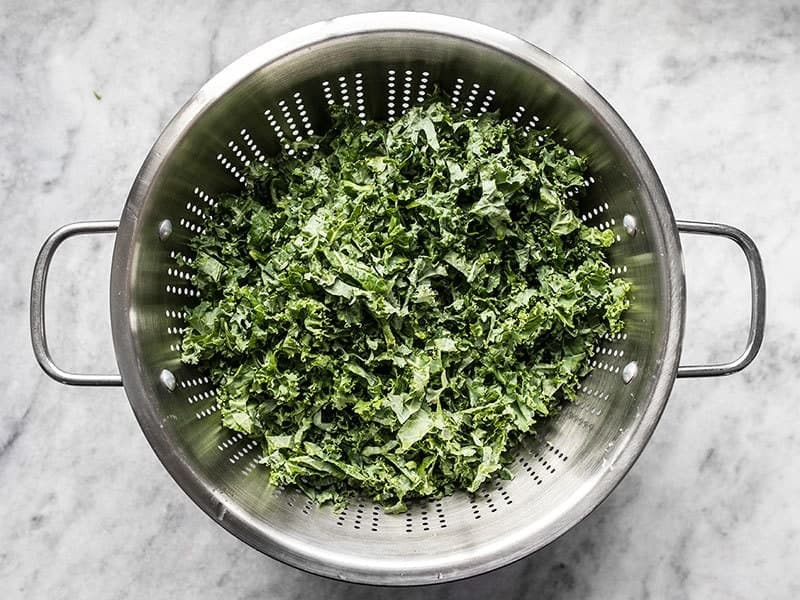 Rinse the kale well in a colander, then let it drain as you prepare the rest of the ingredients. Cut one whole wheat pita into 1-inch triangles. 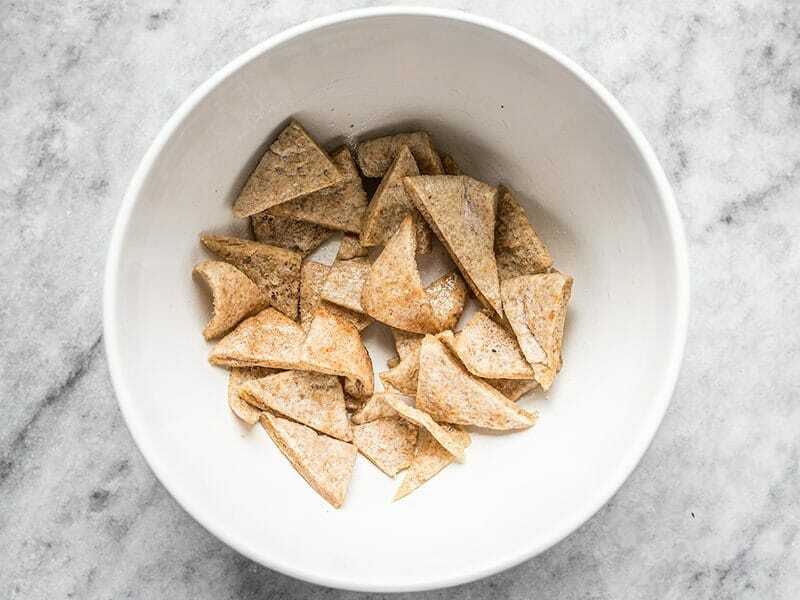 Place the pita triangles in a small bowl and drizzle 1/2 Tbsp olive oil. Toss the pita until it is well coated in oil. Heat a small skillet over medium, then once hot, add the pita. Stir and cook the pita until it is well toasted and crunchy. Remove the pita from the skillet, then add 1/4 cup chopped walnuts. Stir and cook the walnuts for about 1-2 minutes, or until they just begin to smell toasty. Remove the nuts from the skillet immediately so they don’t burn. 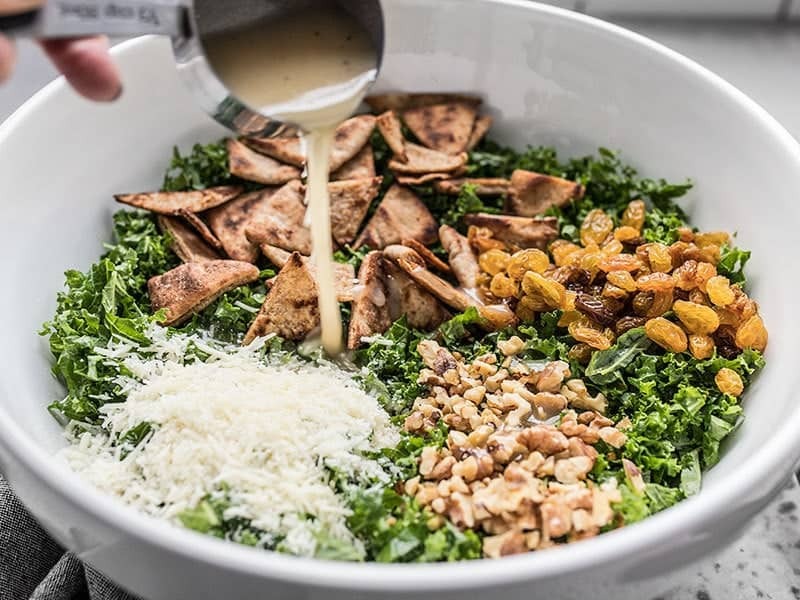 To assemble the salad, place the shredded kale in a large bowl and add the toasted pita, walnuts, 1/3 cup golden raisins, and 1/3 cup shredded or grated Parmesan. Pour 1/3 cup champagne vinaigrette over top. Toss the salad until everything is coated in dressing and Parmesan. You can serve the salad immediately, or you can let it sit for 10-15 minutes and the dressing will soften the kale. And that’s it! The toasted pita absorb the dressing and get super delicious (my favorite part)! My wife loves, and i means LOVES salads! Lately, we’ve been taking turns on who makes lunch. Tomorrow is my turn so I’ll surprise her with this recipe, I know she’ll love it! Thank you! Oh I like the look of that. Just last week I had a bunch of kale and made a marvelous salad with chopped pear and bacon. I love that sweet, crispy salty combination. One thing I did was to massage the kale with a little salt to soften it – that makes all the difference. Oooh pear and bacon sounds SO GOOD. Now I want that, with a little blue cheese, too!